Did Valve hire fashion designers? I feel like their costumes are always so... solid? Not glowy bits everywhere. It would be foolish to characterize a 95 on Metacritic as a mistake. It was a resounding retort to all those naysayers against the Source Engine (i.e. me, every other week): Portal 2 would've been harder to make in Unreal. It's as if many Portal 2 levels never really leave the "grayboxing" stage -- maybe that's the joke here? -- and to graybox over and over, properly, you need great brush tools, which UnrealED doesn't have at all. ... Because brushes are supposedly obsolete? Ha. Or maybe we'll just say that it wasn't a risk. 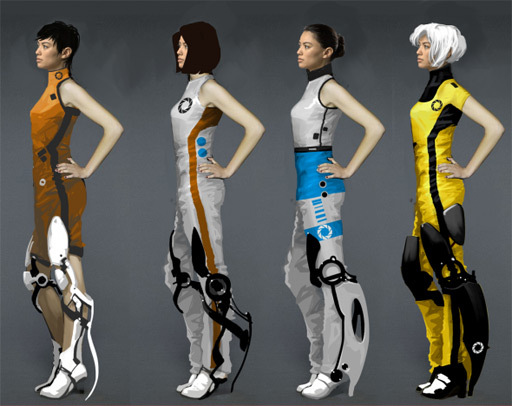 Valve even said as much publicly, back in 2010: "We [asked people what they wanted, and they said more portals and GladOS, so we shelved this other promising prototype and did as they asked.]" Within the first minute of the game, they ask you to "appreciate the Art." Ding! The implication is that this game isn't meant to be bold Art -- rather, it's a supposedly higher calling -- it's Entertainment. This self-awareness even comes through in the pacing: they're fully aware of the "solve a chamber, listen to a joke, take the elevator" pattern of the whole game. You know they're aware because they break that pattern several times. Those breaks are effective because you, the lab rat, were conditioned to expect certain things. Your growing ennui with that pattern mirrors the game narrative itself. You're tired of this game, of her? No, you've got it all wrong... GladOS is sick and tired of you, the player, panting and sweating as you run through her corridors. Why weren't you grateful? She was just giving you what you wanted. Now, there's a particularly relevant quote by Henry Ford on the subject of focus-testing game concepts: "If I had asked what people wanted, they would have said faster horses." We would've said to put Half-Life 2 in Black Mesa. We would've said to make Team Fortress 2 a realistic military shooter. ... Well, looks like this time we got our faster horse. Ain't she a beaut?